With the holidays steadily approaching, now is an important time to start thinking about decorating your home. You can bring those old, dusty knick-knacks out from the basement, or you can try something new this year. Wall stickers are the perfect way to decorate your home or office without clutter. 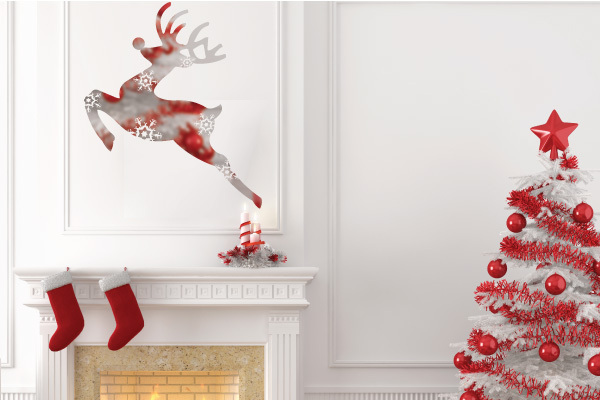 You can easily apply winter or Christmas-themed wall stickers that will completely transform any space. We’ve narrowed down some ideas for you with the holidays in mind that are sure to dazzle you and your guests this season. Bring the perfect touches of warmth and magic into any room this holiday season. Check out some inspirational ideas below to kick-start your excitement about decorating this year. 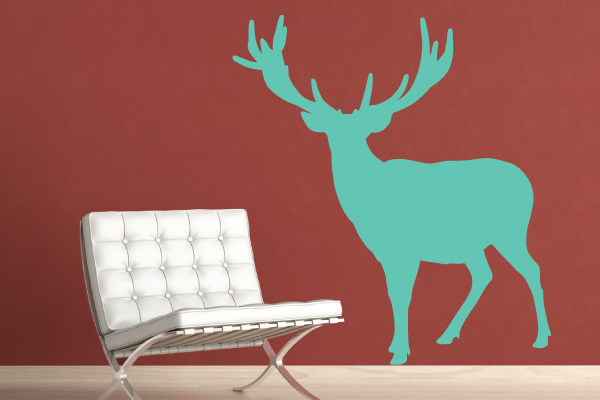 Shop general winter and snow themed wall decals that complement any wall color! Just by adding winter themed decorations, you can prepare your home for the holidays. 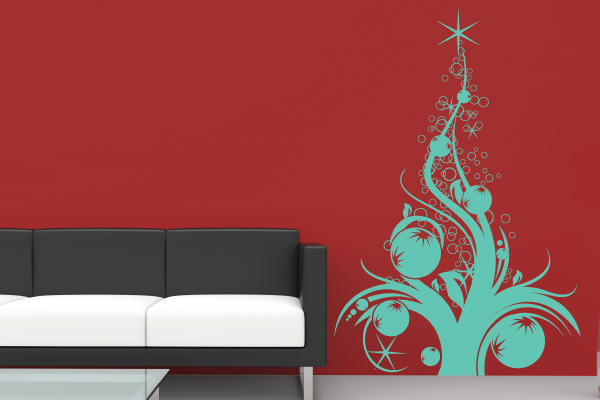 Try our Christmas Tree with Ornaments wall stickers in your foyer or living room to make a grand entrance. This is a great alternative to buying more than one tree! 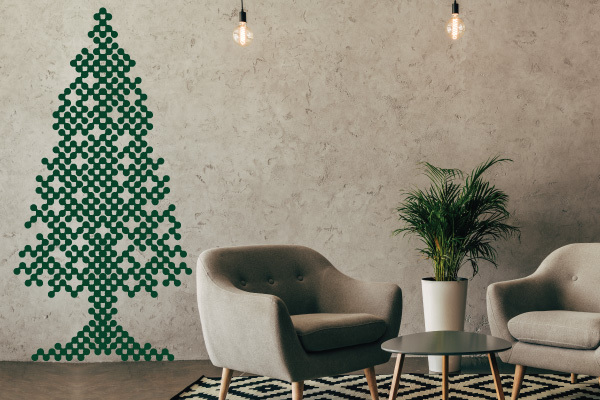 Use Christmas tree wall stickers in place of an actual Christmas Tree if you’re someone who loves to be low-maintenance. Remove the decal from it's paper backing and stick on your wall for a minimal way to show maximum effort. 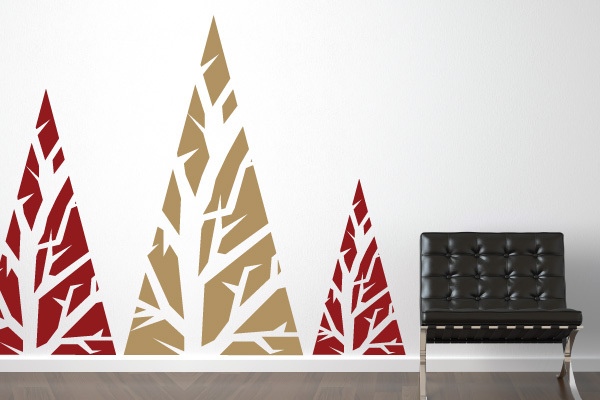 Change it up with this abstract Christmas tree design that will add a modern flare to any room. Who says your holiday decorations have to be traditional? 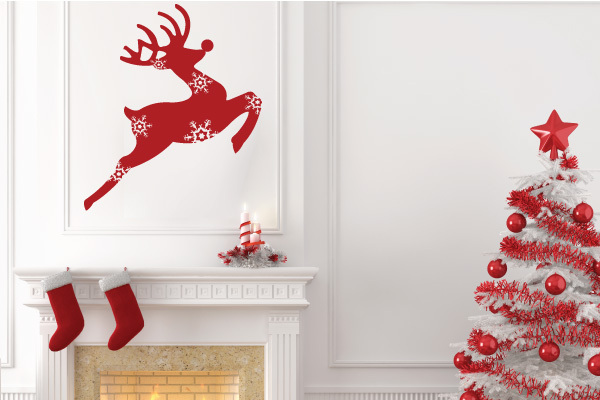 Reindeer decals over the fireplace will remind your family that Santa is coming! Spread holiday cheer and anticipation all around your house. Or get our Rudolph in our chrome or gold reflective material. Metallic holiday animals will add festive and winter touches no matter where you put them in your home. Add some sparkle to your house! Try tinsel decals in your entryways or over your doors that will welcome everyone inside. Deck the halls! You could also try tinsel over a bed to cozy up that space as well. Wall stickers are perfect for guests, or just for yourself too! 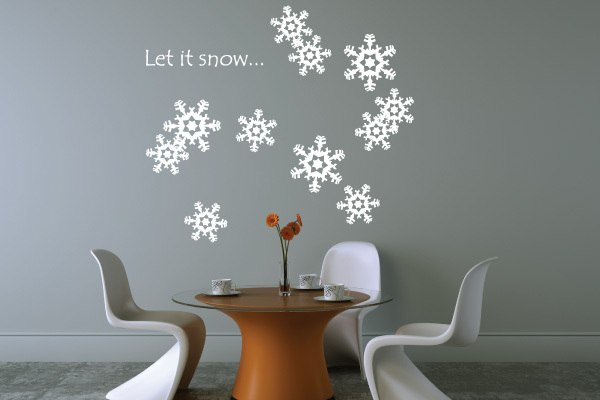 Snowflakes and “Let it Snow” Decals are super inviting when placed anywhere around your home. 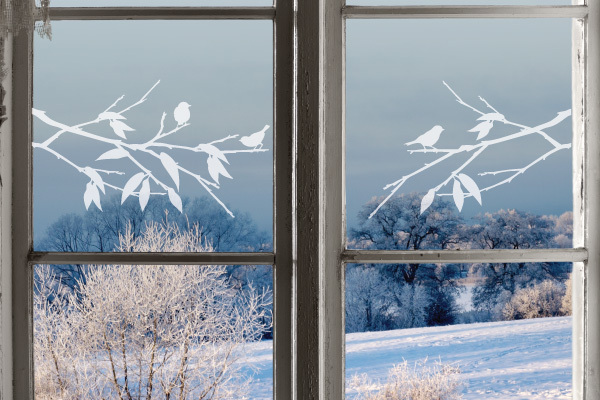 The white decals add the perfect, neutral touch and can be reversed to place on your windows. 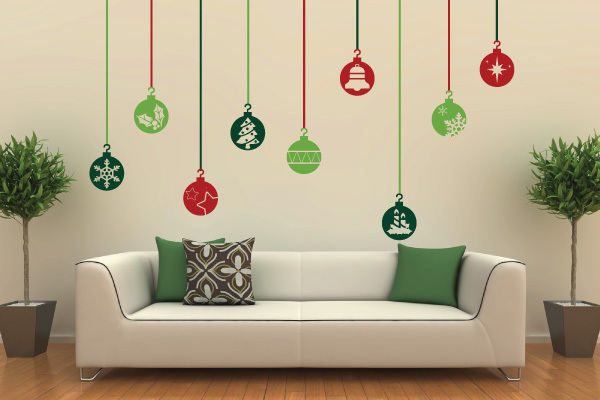 Place our ornament decals over a couch or sofa to cozy up any family room. Remind family that it’s almost the most wonderful time of the year. 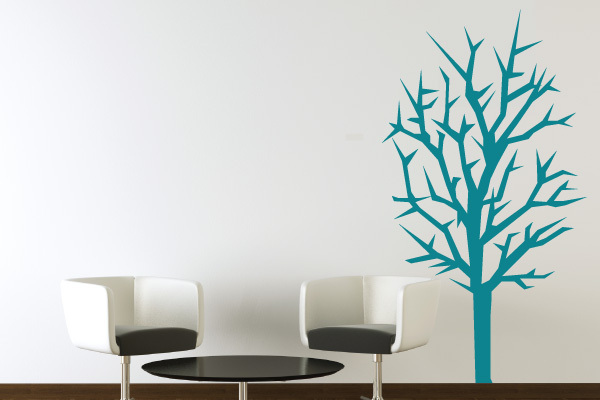 Any generic tree decals will bring the aesthetic of winter inside your home in a more subtle fashion. Create a winter wonderland inside. 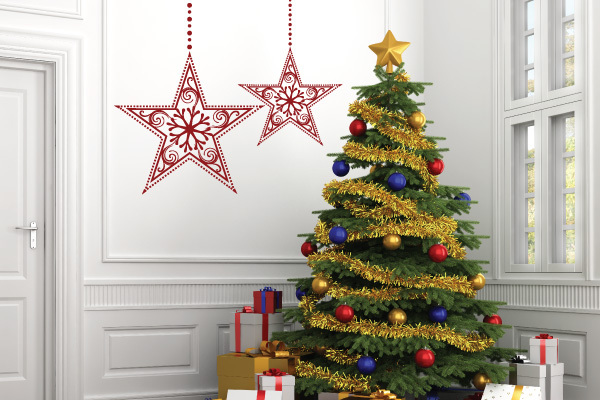 Festive stars will add holiday touches to any room and can be left up year round. Get them in our gold metallic brings warmth into your home. The outline of an elk will bring the outdoors in your home while you stay warm inside. Baby it’s cold outside! A saying or mantra on a Wall Decal can return you to your values this holiday season. Remind yourself of what really matters during this time of the year. Can’t find a pre-made quote you like? Not a problem. Customize a saying or mantra with our lettering options and font selections to create the perfect holiday saying! 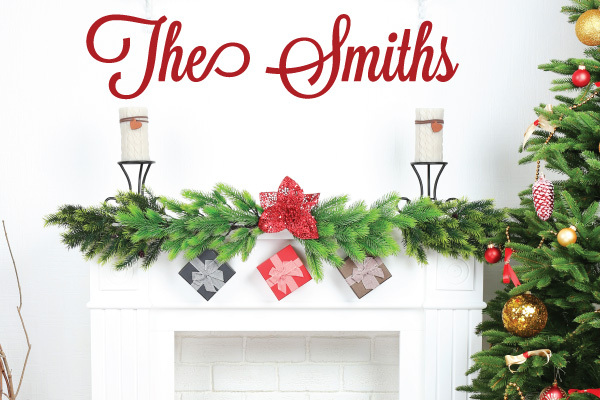 Try labeling where the presents are going this year in your home with arrow shaped wall decals! Let the kids really anticipate Christmas this year! 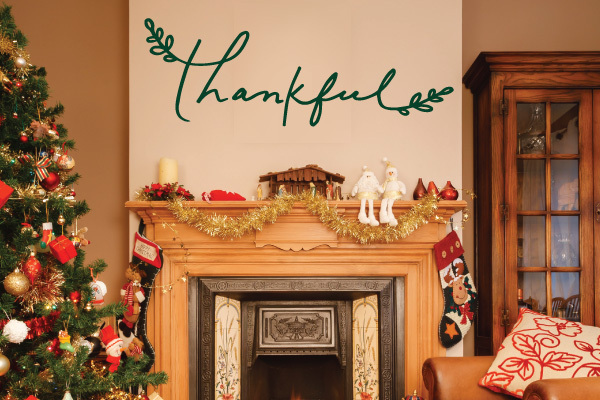 Use name wall decals over the fireplace to bring your family together. A reminder that the holidays are about family coming together. Get a specialty glass decal to place over your windows, or back door. Don’t limit your holiday creativity to just walls! 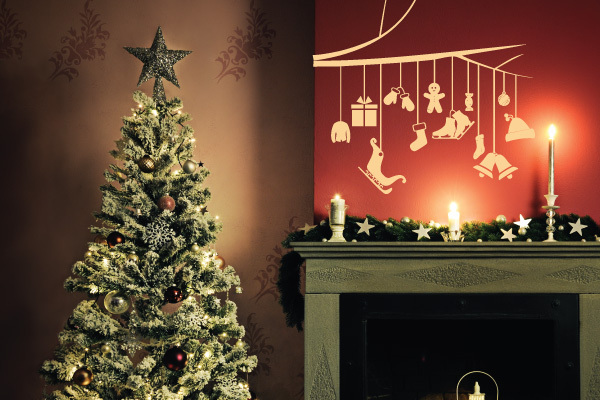 Create your own vision for the holidays with custom wall stickers. Design essentially anything to add to your home this season for the perfect custom addition. 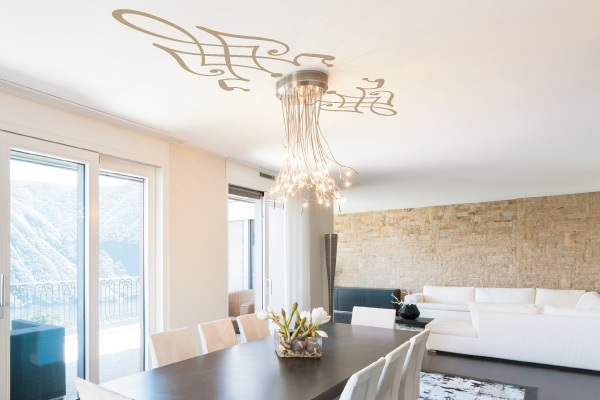 Add a wall decal to your ceiling for a total decorative takeover! Alongside your other decorations, a ceiling decal will transform your home into a haven for the holidays. Add religious touches to your home with angels and holiday trail wall decals. Bring peace to your home this season. 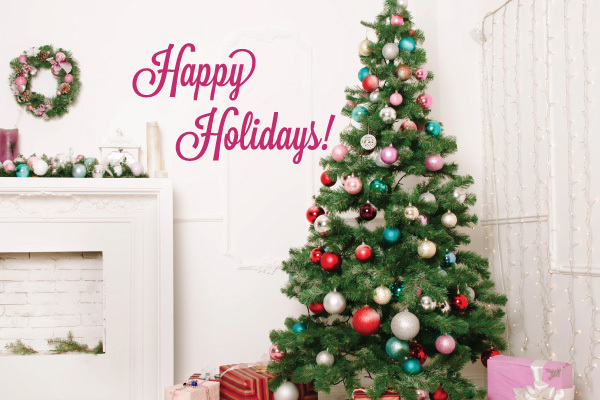 Vintage damask wall decals will pair perfectly with Holiday decorations. 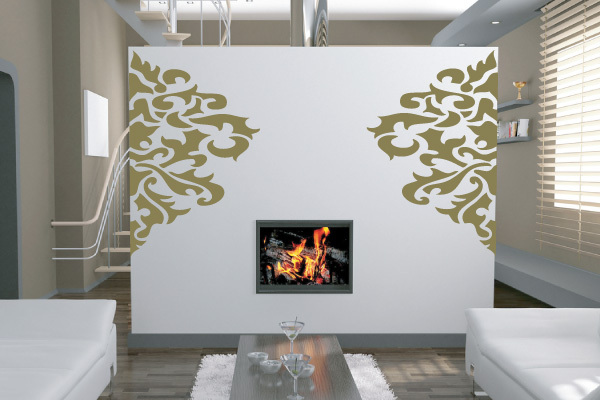 In addition to your decorations, damask wall decals will make a big statement. 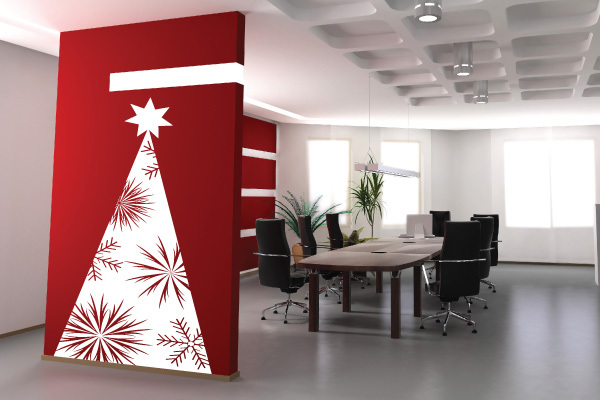 Jazz up the office with tinsel, ornaments, or any winter themed wall decal to keep employees motivated. Keep that holiday cheer up at work! 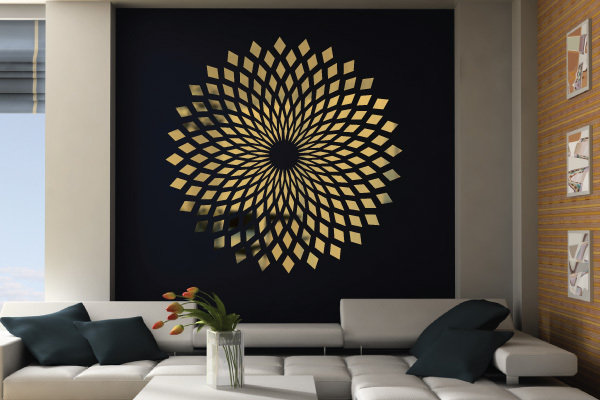 A reflective wall decal is multi-purposeful and adds some extra modern touches to any wall. It will reflect light and color from it's surrounding area to help open up any room. 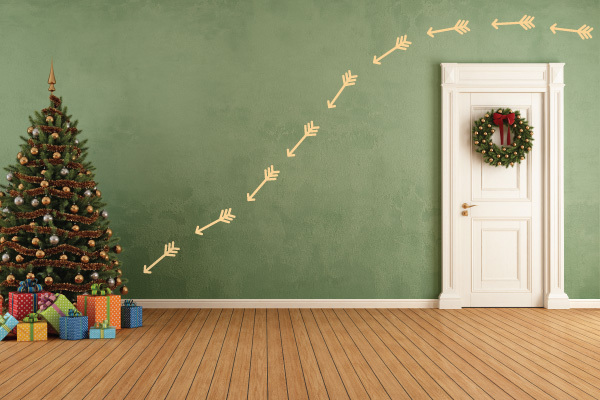 Once you decide to transform your home or office with wall stickers for the holidays, you’ll want to start shopping for them year round. WallTat is the perfect place for you to browse designs and create the custom home you’ll love.